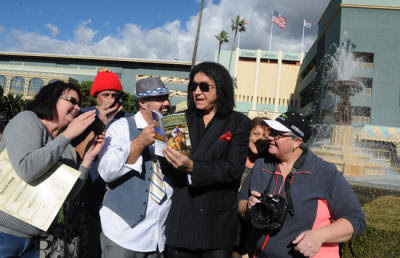 ARCADIA - Opening day for Santa Anita Park's 76th winter/spring meet delighted fans with mostly sunny skies and for some, a few moments with KISS frontman Gene Simmons. In an impromptu photo session, Simmons - clad in a black pin-striped blazer, red handkerchief and his signature black leather pants - posed for photos while chatting casually with media and fans in the Paddock Garden. "You can feel the excitement," Simmons, a savvy businessman who is now helping Santa Anita's parent company, The Stronach Group, with marketing and entertainment at its racetracks, said Wednesday shortly after the first race had posted. "First of all, Arcadia is just beautiful. The drive up here is just gorgeous. Even God likes it - look at the day. He placed the setting, the mountains, the location ... The people (working at the track) are nice too."